Over the last few weeks I’ve been working hard on some really cool software. It’s called SEO Resurrection and I’m launching this with my partners Simon Warner and Richard Fairbairn tomorrow (Thursday 13th December) at 10am EST. Been Affected By Any Google Updates? SEO Resurrection is the first (and only) software themed around Googles brand new Disavow tool. The Disavow tool enables you to tell Google which links to ignore and not count as part of your “link profile”. This means that you can finally get rid of shady or spammy backlinks and resurrect your websites from despair and put them firmly back “into the rankings”. To identify all your poor quality backlinks would take “forever”… and this is where our new software comes in! 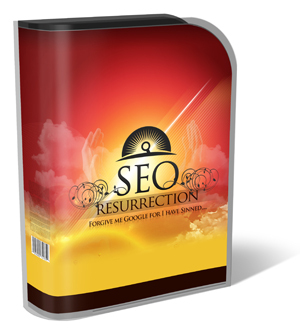 Those who act quickly will be able to buy the SEO Resurrection software for around $9. The price will increase with every few sales so act quickly to get in at the lowest possible price. Those who purchase SEO Resurrection will have the opportunity to purchase my brand new SEO SLEUTH software. SEO SLEUTH is “hot off the press” and is only being released tomorrow. SEO Resurrection will enable you to clean up your link profile…. whilst SEO Sleuth will enable you to take a closer look at the “TOP” ranked sites “LINK PROFILES” letting you see what they are doing in order to rank their sites at the top. Discover where these “successful” sites (or your competitors) get their BEST links from! Uncover their “anchor text” patterns! Instantly uncover EACH sites “TOP” keywords… that bring them their TRAFFIC! Identify the authority and “ACTIVENESS” of a website to identify if they’re a good site to obtain a link from! ALL WITH “PUSH BUTTON” EASE! If you want to snap up a copy of our SEO Resurrection software at the LOWEST possible price, keep your eyes open for our email when we go live tomorrow (Thursday).